Do you remember the NHS Birthday Scroll? 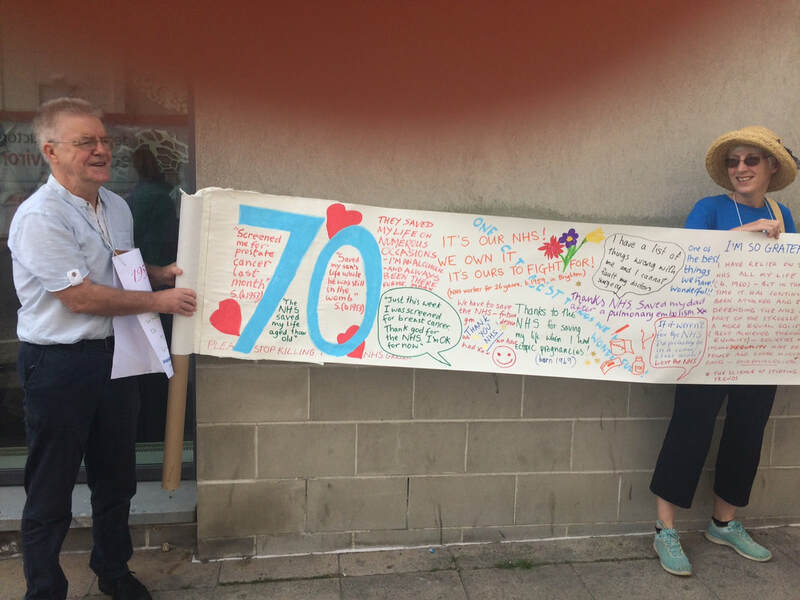 Campaigners created the scroll in Brighton and Hove last year for the 70th Birthday year of the NHS - and it's one of the most moving and uplifting campaigns we have been involved in. On the now 100 m scroll, people shared their NHS stories, their wishes and hopes for the future. On Sunday April 14th there is a chance to see the whole scroll and to be a part of decorating it (yes, crayons and glitter) before it's filmed and begins to be used in campaigning work. So, join the Hanover Defend the NHS group at the Hanover Centre from 1-4 on Sunday 14th. Everyone welcome and there'll be some refreshments. Brighton General Hospital Site: what is happening? The new campaign group Brighton General Hospital Action Group (BGHAG) hosted a packed public meeting on Saturday 23rd - lots of local residents, NHS defenders, housing campaigners, community heritage people all coming together to say: this community asset must be kept in public hands! Much work is going on behind the scenes - there are lots of ways to take this campaign forward - contact BGHAG on bghactiongroup@outlook.comif you want to be involved. And watch this space for more information. THIS LAND BELONGS TO US AND MUST STAY IN PUBLIC OWNERSHIP. ONCE GONE - LOST FOREVER. We are very concerned about the proposed sale and redevelopment of the Brighton General Hospital site. What the public has actually been told about the sale of this public asset is...virtually nothing. We have the warm words of the Trust Board wanting affordable housing. And that's it. Sussex Defend the NHS are campaigning alongside local housing organisations, such as Living Rent campaign, and others to put pressure on Sussex Community NHS Foundation Trust, the local Clinical Commissioning Group and Brighton and Hove City Council to fully explore public uses for this land. This Council notes that the Brighton General Hospital site is a public asset, and as such should be used for public good; prioritising NHS use first and foremost with any spare land used for truly affordable housing. What are Integrated Care Provider contracts? These are US style contracts that give the local Integrated Care consortium a fixed amount of money for the health of their population - crucially, treatment and care will no longer be based on people's needs or clinicians assessments but on the fixed budget for that area. And these massive contracts can easily be awarded to private companies, in fact in many cases it is highly likely because of the inclusion of social care. Brighton and Hove are well on their way to introducing this contract - papers to the November and January Health and Wellbeing Board outline plans clearly - but a final decision is not being made until 'the summer'. Please contact your councillor to oppose this move. Find out which prospective councillor candidates will oppose the destruction of our NHS - take care who you vote for in the local elections in May. Remember, Jonathan Ashworth, Labour Shadow Health has called for ICP's to be scrapped. There is a handy new site from Ration Watch where you can see what your CCG is doing (not doing) compared with other places. Not that there is a postcode lottery says NHS England - all based on sound clinical judgement... That is, of course, a nonsense. There is a very unfair, unethical and going-against-principle-of-the-NHS postcode lottery and every other kind of lottery going on. Brighton and Hove are rationing and restricting hernia repair surgery, hip and knee replacements. Write to your MP, your councillor, ask a question at the CCG, the Health Overview and Scrutiny Committee, ask your GP. Join us in campaigning. Ration Watch also has a place for Ration Stories, so do share with them, and with us. Further details about rationing - scroll down the page. We are hearing about lots of patients who are having clinically indicated treatment denied. They are told the treatment they need is no longer available under the NHS, or that they must wait for things to get worse, as they don't yet meet the higher threshold for treatment. Patients are faced with a stark choice - either pay for private treatment or go without. Under the guise of Clinically Effective Commissioning, Brighton and Hove CCG have named 107 procedures that they will either be stopped or made harder to access. And the list is open-ended. It can sound plausible: of course people want clinically effective treatments, of course people don't want the NHS wasting money on treatments that don't work. But even Brighton and Hove CCG say that some procedures are low priority because of lack of funding - not clinical judgement - and this is leading to the rationing of care. People are being turned away for varicose vein treatment, for ear blockages, for treatment for heavy menstrual bleeding, for knee pain... the list goes on and on and on. We have had patients contact us to say their doctor said they would benefit from a procedure/treatment but the NHS no longer funds it: your only choice is to go private or go without. Sussex Defend the NHS is outraged at this betrayal of NHS principles - and local Brighton and Hove Councillors on the Health Overview and Scrutiny committee (HOSC) are extremely concerned and are waiting for the CCG to give further details of the number of people likely to be affected and the clinical evidence that might show that some of the procedures on the list are genuinely not useful. HOSC is the Health Overview and Scrutiny Committee - the council body that should be scrutinising local health service provision. Brighton and Hove HOSC will have to form a Joint HOSC - joining with the other HOSCs in Sussex and part of Surrey - because the Alliance of CCGs is saying there is going to be "Substantial Variations in Service" across the whole area. We have asked Brighton and Hove HOSC to tell us what these planned Substantial Variations in Service are. We feel that the ability of councillors to scrutinise or reject these proposals will we very much weakened in a JHOSC, just two councillors from each area will mean Tories will be in the majority on this committee. Though it seems our local HOSC will be able to retain oversight of local NHS decisions. Please contact your councillors about all these issues. Residents of East and West Sussex no longer have access to specialist advice from a Low Vision Clinic. In Brighton and Hove, the City Council took over the funding when the CCG pulled out in March 2018, but the Low Vision Clinic in Montague House only serves residents with City postcodes. The Council have earmarked funding for 2018-19, but this is subject to their budget meeting in February. If you, or someone you know has been affected by these changes, or if you are concerned about the loss of support for people with sight loss and the uncertain future, please write to your MP and local councillors. The Model Letters - available here - came out of a meeting of the Low Vision Network, and you may find them useful. The BBC’s NHS Tracker https://www.bbc.co.uk/news/health-41483322 provides the following information for Brighton and Hove. The whole NHS is being failed by this government - but patients in our area are suffering longer delays than the average for England. for Sussex Defend the NHS! The brilliant local artist Nic Watts - who designs lots of our campaign materials - is allowing us to use his copyrighted designs on postcards that can be sold. Our lovely friends at the iO gallery (Brighton Designers and Makers) have agreed to stock the postcards. They'll cost £1 to buy with a good percentage of that coming to us! So, rekindle your love of the postage system and get sending! Here is a sample of Nic's fabulous work. It was a great meeting - really interesting speakers with both national and local perspectives - and details of how NHS care in Brighton and Hove is already reduced due to the Tory cuts and privatisation agenda. Really good to have local prospective councillor candidates who aren't willing to go along with Tory plans and will fight to save our NHS! Choose carefully who you vote for in the local council elections in May! Please support 999 Call for the NHS as they take their legal challenge to Integrated Care Provider contracts to the Appeal Court. These Integrated Care Provider contracts are due to come into force in March 2019, yet the public consultation has only just finished and court cases yet to be settled. 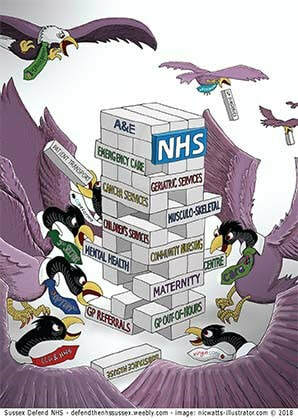 999 are legally challenging the Government's plans to introduce Integrated Care Providers (formerly called Accountable Care Organisations) These contracts will mean that NHS services are no longer based on need and population health but on a fixed budget for a given population. This court case will affect us all. 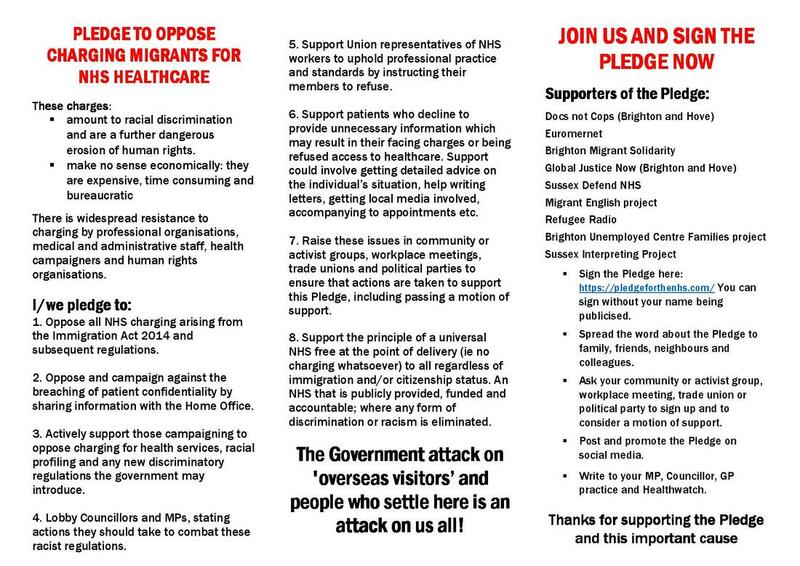 After NHS Digital halted their data sharing programme with the Home Office in May 2018, Migrants Right Network and Liberty continued to pursue the legal case to stop this aspect of the Hostile Environment. They rightly argued that people should not be scared to access health care in case their GP / Doctor / nurse shared their details with the Home Office. In November we learnt that this data sharing is to be scrapped (although not totally as NHS DIgital can still share some details if the patient is being charged with a serious crime). As Doctors of the World report, this is still a massive victory in our dismantling of the Hostile Environment and it must bring heart to both NHS and migrant rights campaigners. Sussex Defend the NHS applaud the amazing work by these campaigners - we continue to promote our Pledge for to stop extended charging. Don't let them package up your NHS for sale! Please get in touch if you would like to borrow the exhibition panels, or would like copies of the summary booklet. Our scroll, marking the NHS 70th Birthday and defending it against its continuing destruction by this government, (as explained by Alex Scott-Samuel) is now 100 metres! Contact us if you still haven't added your own message - there is still time to squeeze you in! Sussex Defend the NHS are supporting two local initiatives. We shared information about the Brighton and Sussex University NHS Hospital Trust (BSUH) poor record on racism before. Now the BSUH BME Network has been sidelined by senior management at the hospital trust. We are supporting their petition and other actions - Please sign and share the petition. We need to stand up for local BME networks in the NHS if institutionalised racism is to be tackled. Last year over 100 people came to see the brilliant Private Finance Initiative: How come we’re still paying for this? . It’s clear that PFI, like outsourcing and other forms of privatisation, is designed to allow private companies to make extravagant profits from public services. - In 2016/17 700 fewer requests being made for social care services even though the number of elderly and frail people is rising because the rules changed and fewer people are now eligible. What happens to these people who are no longer eligible for care? - More government funding for social care is needed. - Brighton and Hove Council provides social care with a triage system, urgent cases can receive help within 24 hours, but those assessed as non-urgent can wait up to 13 days. GPs felt 13 days was too long to wait when someone might be at risk. - Community care, funded by the NHS, provided by Sussex Community Foundation Trust, is for patients who need health care. David Supple, CCG Chair, said GPs finding it difficult to access social care for patients, or unsure whether the patient needed social care of NHS care should contact CCG and he would deal with their problem. Tonsillectomies, which they only propose to deal with in extreme cases. Hemorrhoids, where they contend that in less severe cases they can be dealt with by just eating more fibre and drinking more water. Knee arthroscopy for osteoarthritis in the joint, where, it is contended, surgery is not effective, it's just a case of losing weight and managing your pain! Procedures effecting women in later life are dealt with in a cursory and particularly dismissive way. The most worrying aspect to all this is the covert way in which this survey has been rolled out, with many of these cuts having a major impact on the health of the local population if they were to be carried through, and yet with so few people being aware that they are even being proposed. Brighton A&E consultant Rob Galloway's moving plea for this real story to be told. ​full reinstatement and full refunding of our NHS. http://www.stopthestps.org.uk/​What is happening with our Sustainability and Transformation plan (STP)? Is it becoming an ACO? Contact your MP or local councillor. There is a template on our website and the brilliant NHS Support Federation has easy to follow links on their STP page. Please sign our STP petition if you haven't already. campaign group are listing MP's who support the bill, and asking others to come forward. Two of our local MP's, Peter Kyle and Simon Kirby, currently do not support it: come on constituents, book those surgery meetings! The NHS A Visual Essay NHS A Visual Essay from juniordoctorblog.com, explains how the Tories have underfunded the NHS so that it is now in crisis. Please share it far and wide - we can't let them win. All the ideas in the FYFV and the STPs come directly from reports produced by the World Economic Forum which were discussed at Davos in 2012. Simon Stevens chaired the key committee that developed the reports – which were both co-authored by McKinsey. Until now we have always had to make inferences about the connections between key actors and political parties in the development of NHS privatisation. Now for the first time we have clear objective evidence of who is culpable and how. The sick truth - the Tories recruited the NHS Chief Executive from the international business elite, in order to implement these plans, drafted by international corporations and their friends, and pretended that they had been drawn up with the people of England in mind. Make sure everyone you tell everyone you know. Thank you to everyone displaying our poster! 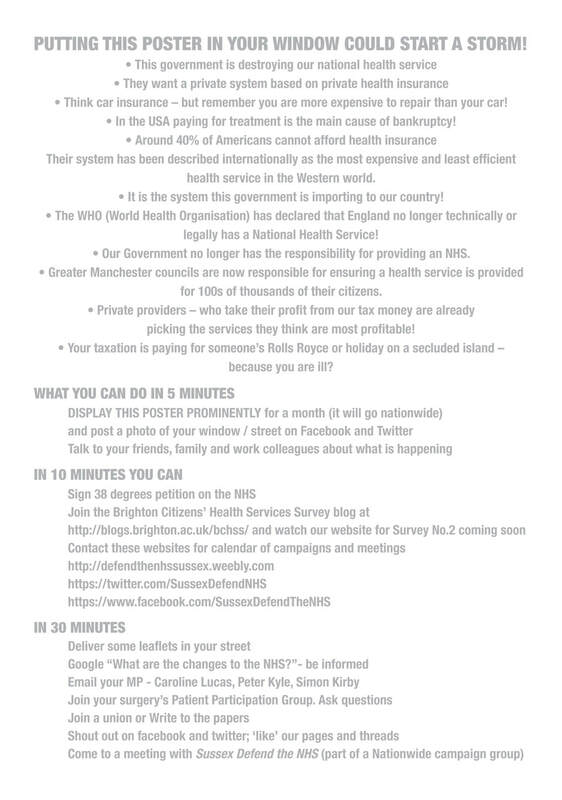 ​Donate to Sussex Defend the NHS. We are fighting against the odds to Save Our NHS. Your donation will help us arrange public meetings, events and dramas, produce leaflets, and campaign against the underhand way the government is privatising the NHS. Sussex Defend the NHS is a network of nearly 3000 local campaigners, health workers, and trade-union activists. Our organisation has no affiliation to any political party. We are campaigning to save our National Health Service, which for nearly 70 years has provided a cost effective, universal health service, free at the point of need to all people irrespective of their background, circumstance or ability to pay. Years of cuts, piecemeal privatisation and irresponsible re-organisation mean we are rapidly heading for a rationed service, run for profit by big companies, US-style. Please join the fight to re-instate our NHS for the benefit of the patients and the staff who care for them.